Smash cakes seem to be a rite of passage for many of today’s children, and I wanted to share a few easy ways to decorate them! 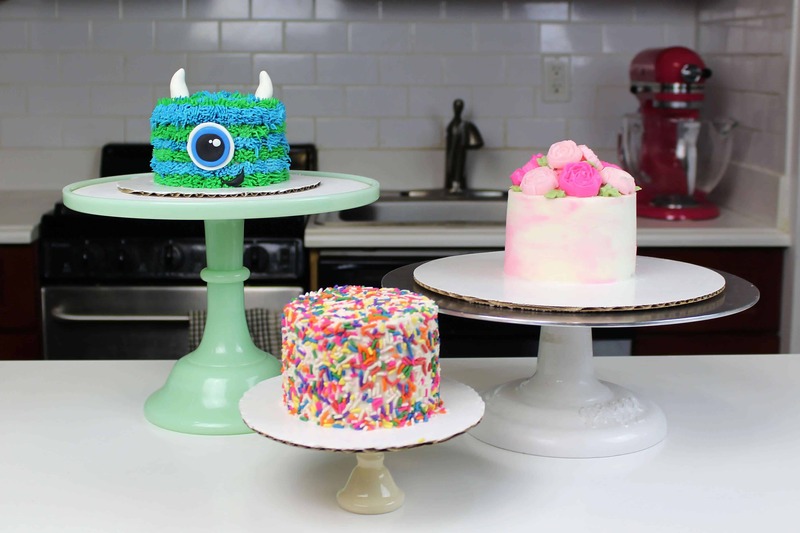 These smash cakes are inspired by Baked by Melissa’s (Melissa Ben-Ishay) new cake book! It includes a banana smash cake with a straight peanut butter filling, which she used to celebrate her daughter’s first birthday. This helps keep the sugar levels low in the cake…or at least lower than a normal cake! If you’re interested in ordering her book, you can click here. I was able to make 3 smash cakes out of one batch of a banana cake recipe, which I baked in two half sheet pan! I built each smash cake using 4 inch circle cut outs. Each cake was built with three layers (total of 12 cut outs). You could definitely make larger cut outs if desired, or bake the layers in cake pans as opposed to doing cut outs. 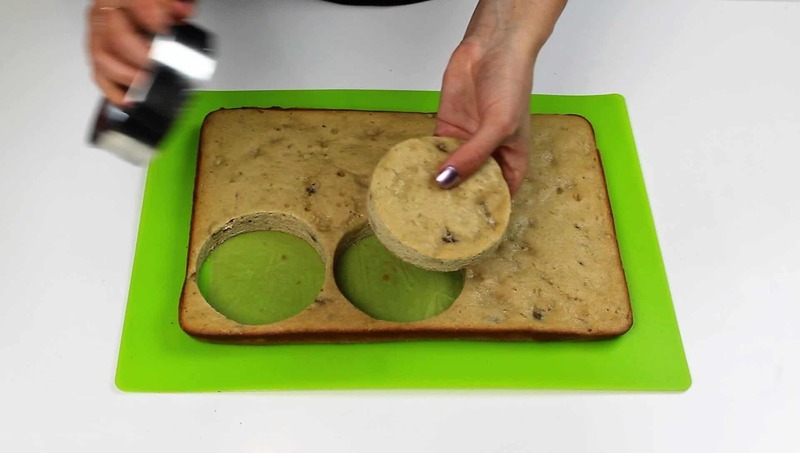 Once the cake batter is baked and cooled, cut out circles of desired size. 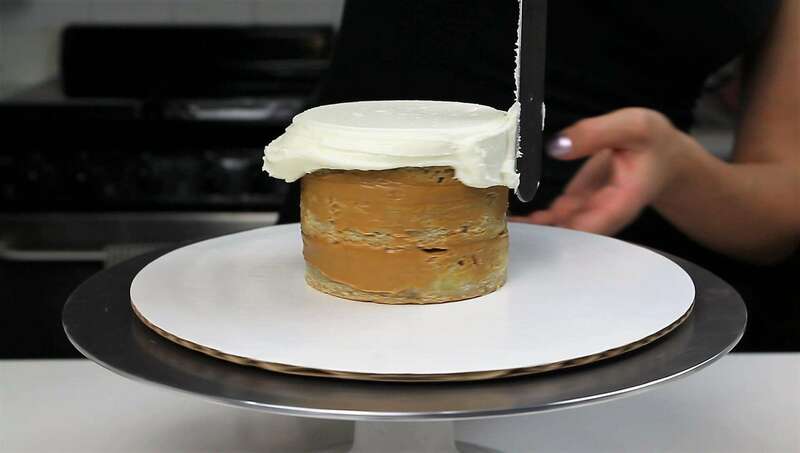 Stack the layers, applying an even layer of peanut butter between each layer. Chill cake in freeze for roughly 10 minutes. This will make them much easier to frost. Once chilled, apply a thin layer of frosting (crumb coat) using an offset spatula or butter knife. Be sure to cover the entire cake, so that all the crumbs from the cake layers will be locked in place. Chill the cake in the fridge or freezer until the frosting is firm to the touch (5-15 minutes), then add a second, thicker layer of frosting. Smooth using an offset spatula, and a bench scraper. 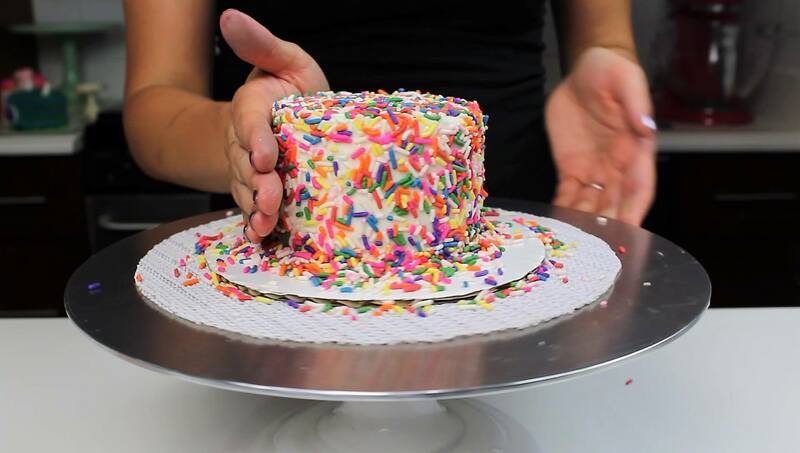 For the sprinkle version, take a handful of sprinkles, and very gently press them into the frosting. You want to press just firmly enough to stick them into the frosting, but not hard enough to cause an indentation in the smooth frosting. To make the pink flower version, color 5/6 of the left over frosting pink, and color 1/6 of it green. 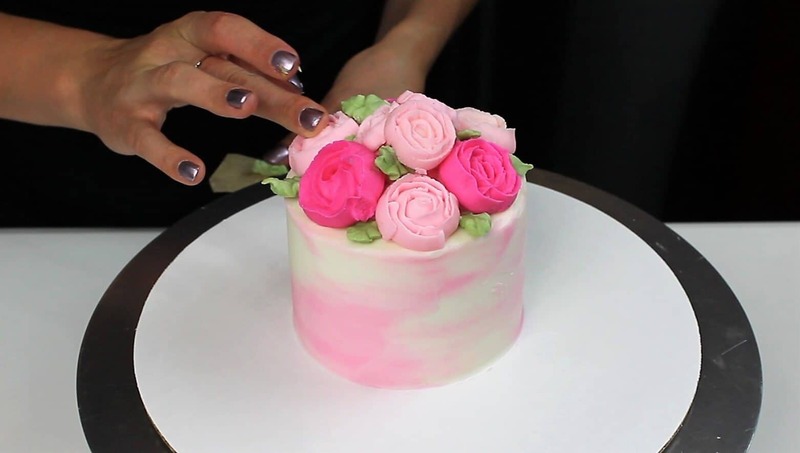 Add dabs of pink frosting around the cake, and smooth around the cake to create a watercolor effect. Place some pink frosting into a piping bag with a wilton 1M tip, and pipe buttercream rosettes on top of the cake. If you have a wilton 103 or 104 tip, pipe roses onto parchment squares, and freeze until they’re firm to the touch (as seen here). Gently peel them off the parchment paper, and place on top of the cake. Add small dabs of green frosting between the flowers, to look like leaves. 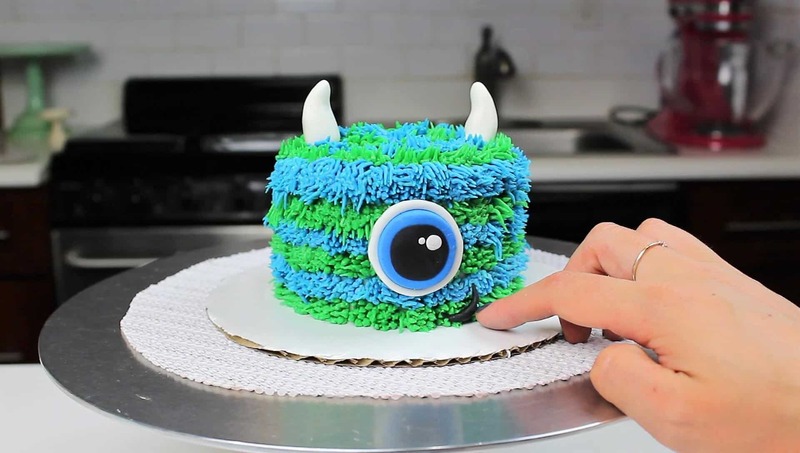 To make the monster-inspired cake, divide the remaining frosting evenly between two bowls, and color blue and green. Place colored frosting into two separate bags with a grass tip. Starting at the base of the cake, pipe horizontal stripes of blue and green around the cake, until it is fully covered. Make fondant horns and eyes (could also use an oreo cookie for the eye, and macadamia nuts or almonds for the horns), and gently press into buttercream. Thank you! Those baby cakes are adorable. I think one batch should be enough for that small of a cake! Hi, If I only want to make one 4″ or 6″ 3-layered cake for a smash, can I make a smaller quantity of cake mix? How much would you recommend? and also how much icing would you use on one of those for your leo the lion? I’d recommend cutting the recipe in half to make 3, 6 inch layers! Thanks very much. I ended up making 1 cake mix and using the 4th round cake to cut 3 4″rounds out of it to make 1 large 3 layered and 1 small 3 layered cake. worked wonderful! I did 2 leo the lions with your buttercream 🙂 would love to post a pic but can’t see that option. Also made your vanilla cupcakes. Thanks again, I’ll be looking up your recipes every time now! aw I’m so happy to hear that 🙂 Thanks for sharing!!!! Oops! I meant to say I used 1 batch of your butter cake mix! Looks great for kids! How long & @ what temp did you bake the cakes in the half sheet pan? Thank you! I add flower nails to my sheet pans when I make them, and they actually bake up in about the same time as normal layers!! 🙂 sometimes it takes a couple minutes longer, but it can vary based on the recipe!